Wedding Wednesday: How to choose your Wedding Party ~ Roses and Rain Boots . As if wedding planning needs to get any harder, they add choosing the wedding party on the list! Besides choosing a venue, which is by far the most challenging aspect of wedding planning, simply because you can't do ANYTHING else until you have one. Since let's face it, the venue usually determines the date of your special day. The second most challenging aspect was the task of choosing the wedding party. Originally, I was really turned off about picking a bridal party because I felt as though I was "ranking" friends. But I quickly that wasn't the case. 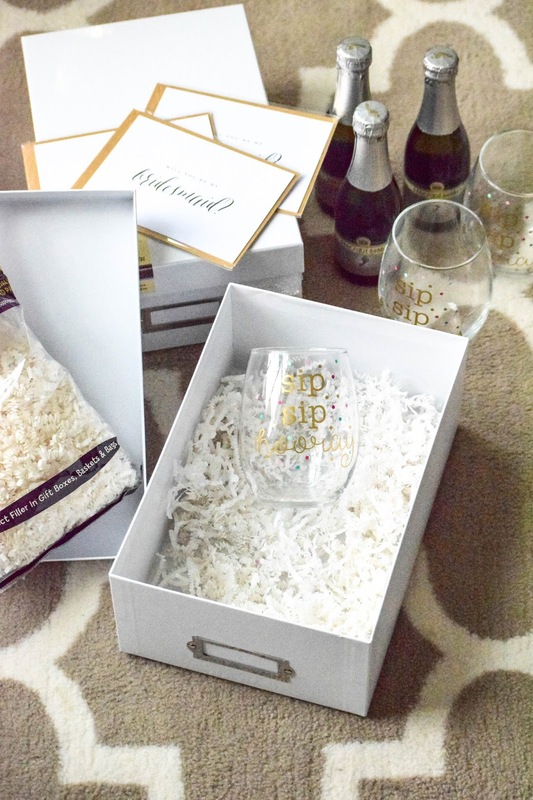 Continue reading to find out the top 3 tips I used to pick a bridal party I am over the moon excited about! 1. Decide together on the size of your wedding party. My fiancé and I priortized what was important for us in a bridal party. 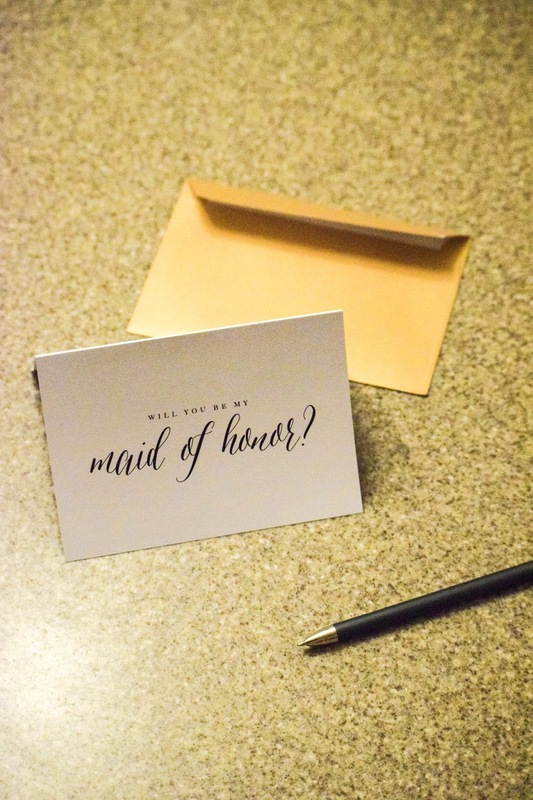 We decided that we wanted to keep it small, since we are aware of the financial piece burden that comes along when committing to being in a friend's wedding. Many wedding websites will tell you the "golden rule" is 50 guests to 1 bridal attendant; however, even we ignored this rule. 2. Choose wisely. I spent a long time deciding agonizing who I was going to ask and the more I thought about it. My biggest struggle was I didn't want to hurt any of my friends feelings. I have been so blessed with so many wonderful friends I didn't want anyone to feel left out, but realistically I wanted a small bridal party. I guess when it comes to life struggles, having too many ah-mah-zing friends is a good struggle to have. So after careful consideration I realized that choosing my wedding party was about choosing the people who play an important role in my day-to-day life because these are the people who will be there helping me on the most important day of our life! 3. 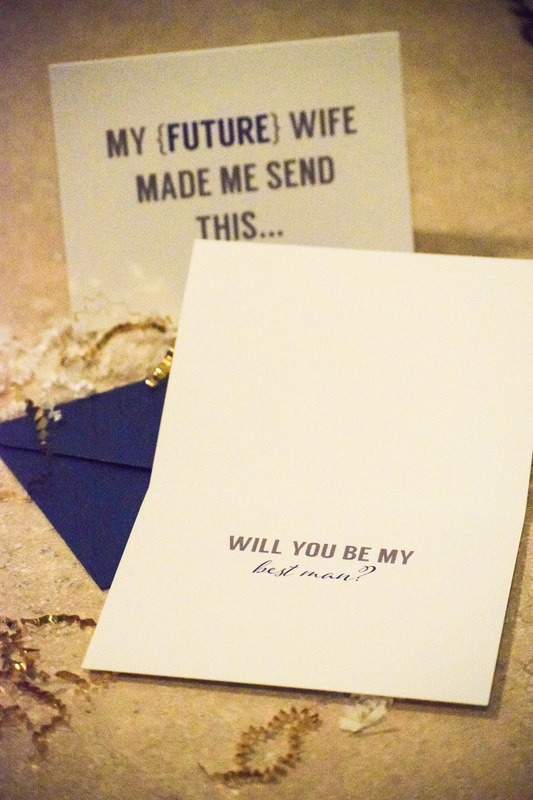 Lastly, pop the question to your wedding party! Asking your the friends to be your bridesmaids/groomsmen in a particular way has become a new trend that I can definitely get on board with. This was step was extremely important to me, because I wanted the wedding party to know how much we truly valued the commitment they were making to being apart of our special day. 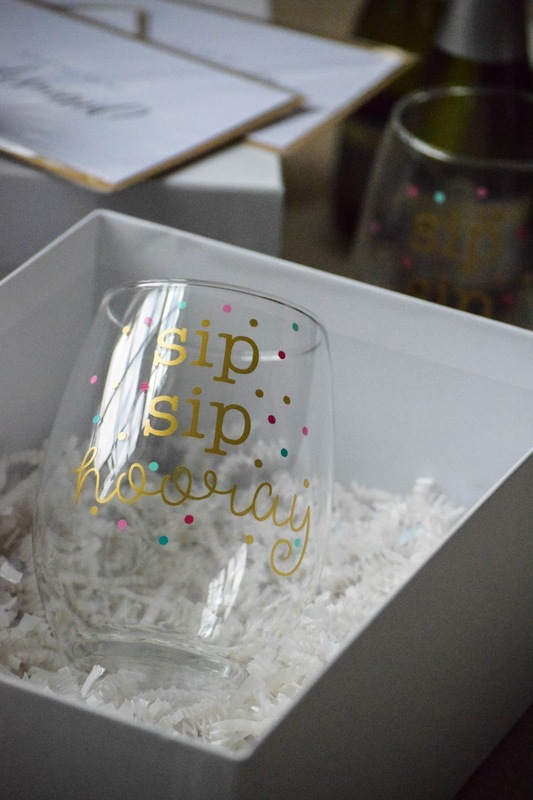 In the bridesmaids swag boxes I wanted to include something practical and useful. I knew the wine glasses and glass filler would be extremely useful to help them get through those late night phone calls from me. I also wanted it to be a glass they would use for years to come. Although there is no visual reminder of the wedding day, I am confident the girls will smile every time they use it and be reminded of all the fun we had in preparation. The glasses featured, were a custom collab. with Culley Creations, who I feel in LOVE with after my bestie gifted me her "Future Mrs Mug" It's the only dish I religiously remember to wash everyday. The cards were also a great find from this designer in Ireland. Her items are classic and timeless, the style I hope to emulate for our wedding. I also loved the card because it allowed me to explain and personalize why each girl was chosen to be apart of my wedding party. 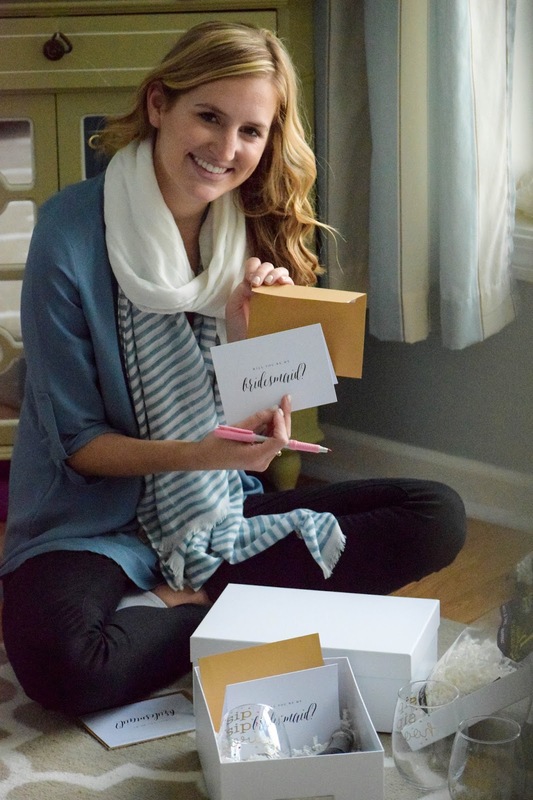 Be sure to check out more of her amazing cards at her Etsy shop: Kismet Weddings. I bet you can already guess the few other cards I plan to use from her shop in the future! Not let's not forget the groomsmen. 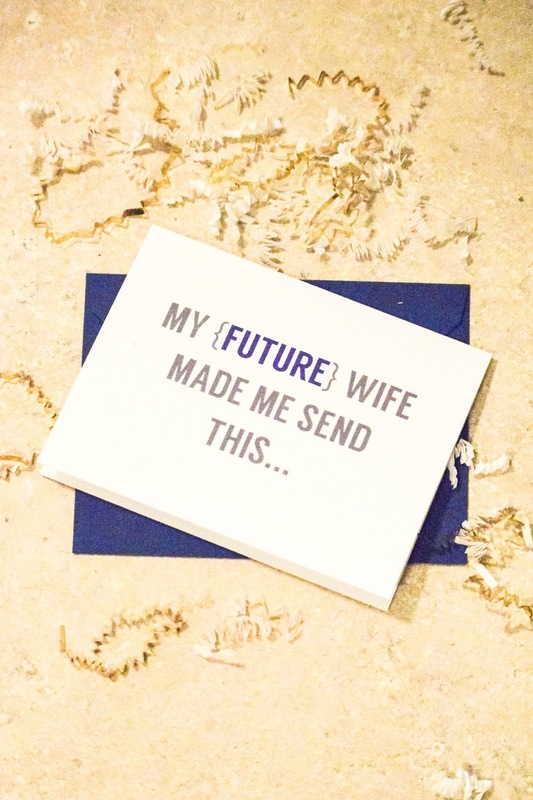 While browsing on Etsy I found the MOST perfect, but seriously, the best cards for my fiancé to share with his men. Check out more of her adorable cards for any occasion at her Etsy Shop Carina Paper Co. Awesome tips. Love the cards + glasses! This is SO cute!! We just asked out wedding party but I wish we would've done something more festive like this! 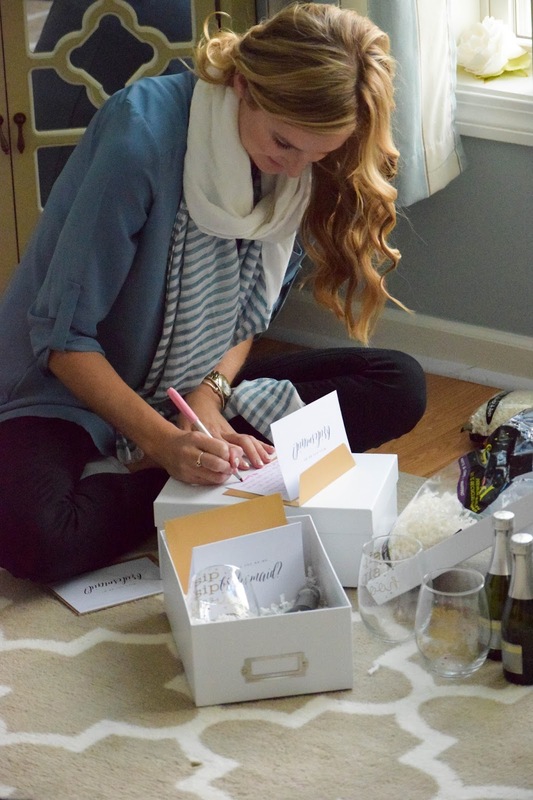 I asked my bridal party using Chinese takeout boxes with Godiva strawberry chocolates, burgundy and blush nail polish, and wrote the question. 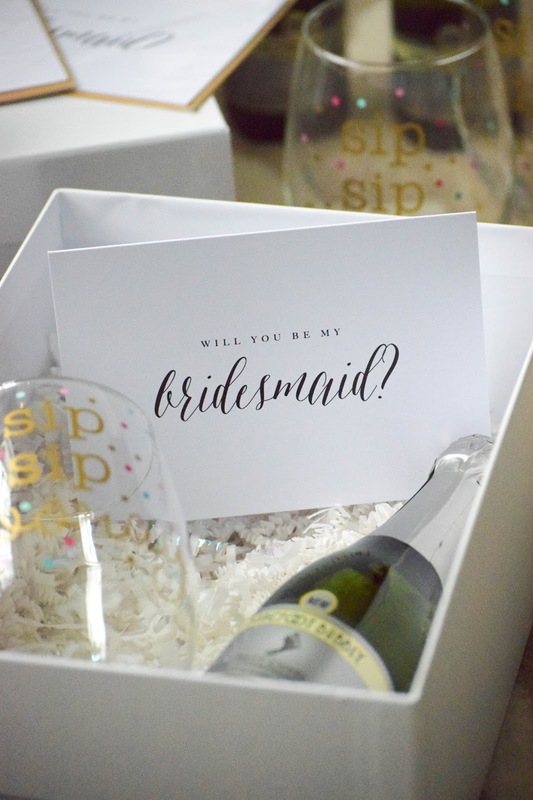 You are right in not asking too early, I became close friends with 2 girls (after I asked my bridal party) and wish I asked them, but my fiancé suggested earlier beforehand to ask his sisters to be bridesmais...oh well, I am sure they are honored!